Stanford, Calif. • Jasmine Moody was sitting at the podium during the post-game press conference when she was asked to comment on her teammate Shaylee Gonzales’ monster game against Stanford. 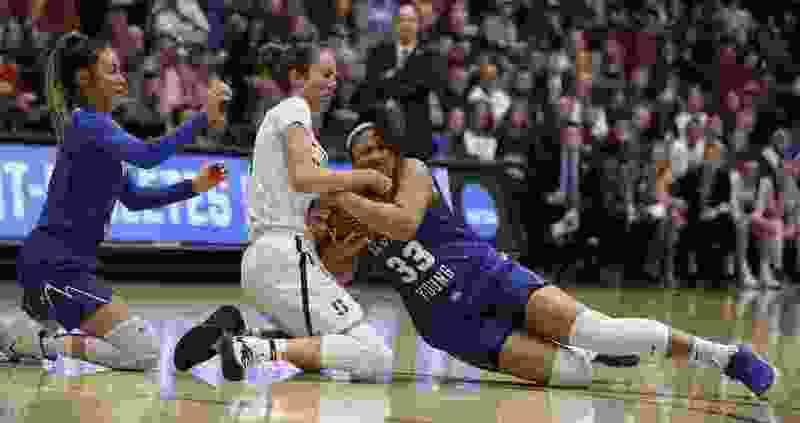 The freshman point guard had 32 points, five rebounds, two steals and an assist in BYU’s 72-63 loss to the host Cardinal in Monday night’s second-round game of the NCAA women’s basketball tournament. “I didn’t even know that she had 32 points to be honest, so good job, Shaylee,” Moody said, patting Gonzales on the back. Gonzales said, “Hello world” to an ESPN audience with an absolutely fantastic game. It wasn’t enough to lift her team to the sweet 16, but it was the kind of performance that showed exactly why Gonzales was recruited out of high school by Stanford coach Tara VanDerveer and why the Cougars are happy to have her. BYU was able to hang with No. 6 Stanford for a half but the Cardinal proved to be too much in the end. The Cardinal (30-4) will play Missouri State in the Chicago regional semifinals on March 30. The Cougars finished the year at 26-7. For most of the night, Gonzales was a one-woman show on offense as teammate Brenna Chase missed her first eight shots from the floor, finally making her first shot midway through the fourth quarter. Chase finished with eight points. Paisley Johnson had 11 for the Cougars. BYU made things interesting with a 9-0 run late but could get no closer than eight. The Cardinal were led by senior forward Alanna Smith who scored 23 points and grabbed 14 rebounds. DiJonai Carrington added 19 and Kiana Williams 13. Once again, the Cougar defense disrupted its opponent into a poor shooting performance. After holding Auburn to 32 percent shooting in Saturday’s first round game, BYU handcuffed the Cardinal in the first half, holding Stanford to 32 percent (12 of 38), including 17 percent (4 of 23) from 3-point range. The Cougars rode that to a 15-11 lead after one and an 18-11 lead early in the second quarter. But the Cardinal used a 9-0 run to take the lead and the teams battled through the rest of the half. It was 29-29 in the final seconds when Williams hit a soft-as-butter jumper to give Stanford a 31-29 lead at the break. It was in the third quarter that the Cardinal finally took control. Stanford went on a 16-0 run, holding BYU scoreless for almost seven minutes of play. Smith hit a 3-pointer from the left corner to make it 48-35, causing Judkins to call timeout. After play resumed, Smith capped the run with a fabulous left-handed follow scoop shot to make it 50-35. Moody finally ended the onslaught with a 3-pointer from the top of the key with one minute left in the quarter.